Dev Chidambaram (left), an associate professor at the University of Nevada, Reno, teaches students in a $150,000 battery laboratory that is part of the school's new "Tesla minor." Photo courtesy of the University of Nevada, Reno. Part two of a series. Click here to read part one. Could the energy storage industry fabricate some of the "thousands and thousands of jobs" that President Trump says he wants? The short answer from insiders is yes. But whether those jobs arrive during his administration or are delayed or lost to Asia will depend in part on decisions Trump makes on trade, energy, transportation and infrastructure. Across the young industry, there are hopeful signs: Students have massed at Tesla Inc. job fairs in Nevada, where the company plans to hire 3,000 people in the first half of 2017, according to a spokeswoman. As many as 150 new jobs were posted recently at a plant in Michigan. CEOs across the industry speak of an upswing, though one that is suffering through a period of Trump-induced uncertainty. If lithium-ion batteries scale up and become a fixture in homes, businesses and automobiles, energy storage could create more than 120,000 jobs, according to SuperCharge US, an industry coalition. Many would be local, living-wage positions that don't require a college degree. Decisions are being made now that will shape the industry's job profile for years to come. Tesla and other energy storage manufacturers are investing heavily in automation, which could make domestic manufacturing competitive — but results in a lot fewer jobs. Universities in California and Nevada are founding the country's first-degree programs that specifically focus on batteries. Energy storage isn't a business where people think small. When Alevo, a maker of grid-scale batteries in North Carolina, started hiring a couple of years ago, 10,000 people applied. The 300 who got hired helped build the first factory line. If the cavernous factory reaches its capacity — 20 times the size of today — it could employ 3,000, said Chris Christiansen, the company's president. "We see the market coming and increasing every year," he said. Energy storage is an octopus whose arms are beginning to extend into nearly every part of the energy business, from transportation to consumer electronics to the electric grid. Decisions of the Trump administration will affect it in many ways. They "will be a source of immense anxiety in the energy community," according to a recent energy storage market report from GTM Research. Trump campaigned on renewing America's aging infrastructure, and a preliminary wish list of 50 projects mentioned one energy storage project, in California. But the administration has not clarified its priorities or made headway on legislation. On a longer time horizon, Trump's call for across-the-board cuts to domestic programs, especially at the Department of Energy, make it likely that energy storage will suffer (Energywire, March 16). Former President Obama's DOE seeded much investment in new energy storage technology. Cuts to those programs would make it less likely that the United States will create a new secret sauce that unseats the current energy storage manufacturing base, now deeply entrenched in Asia. Meanwhile, cutbacks could deflate short-term confidence in the industry. In policy, a looming uncertainty is the depleted Federal Energy Regulatory Commission. With the resignation of member Norman Bay in early February, the five-member commission is hobbling along with only two members and doesn't have a quorum, threatening all energy projects that fall under its jurisdiction, including energy storage (Energywire, Feb. 17). A FERC proposal to open wholesale electricity markets to energy storage in November has been stalled due to the commission being short-handed. 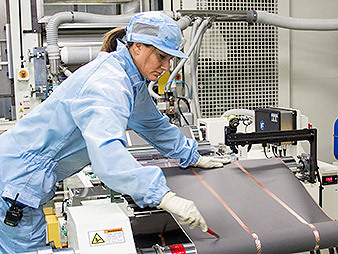 An employee works on a roll of battery material at an LG Chem plant in Holland, Mich. One of the country's largest automotive battery factories, it is currently hiring. Photo courtesy of LG Chem. Another is federal auto emissions standards, which support the energy storage industry by encouraging automakers to make more hybrid and electric cars. Those standards were tightened under Obama, but major automakers are pressing Trump to loosen them. Also unknown is whether Trump's new head of U.S. EPA, Scott Pruitt, will attempt to revoke a long-standing waiver given to California to set its own fuel economy standards, which are the tightest in the country. And then there's trade, where Trump has threatened to raise tariffs against Chinese imports. The future of the energy storage industry "depends on how protectionist our trade policies become," said Mark Barteau, director of the Energy Institute at the University of Michigan. China sold $728 million of energy products to the United States in 2014, more than any other country. Meanwhile, the U.S. sent less than $41 million the other way, according to data from the National Renewable Energy Laboratory. While Trump may want to raise tariffs against China to protect domestic industry, several sources said the U.S. doesn't have the capacity to pick up the slack quickly. That means the biggest impact would be to drive up prices — and greatly slow the pace of the energy storage industry, and its job creation. Energy storage has a long and complex supply chain where the U.S. plays a role at every station. At each lies opportunities for jobs. Nowhere is this more true than with the fastest-growing type of battery, lithium-ion. Mining: The United States has abundant supplies of lithium underground, from Nevada to the Carolinas. But it remains at the exploratory stage compared with large mines in Argentina and Australia. Two mining companies, Lithium Americas and Pure Energy Minerals, are in the exploratory stages in Nevada, while FMC Lithium mines and processes a form of the metal in Gaston, N.C. Cells and materials: The base unit of a battery is the cell. If the industry takes off, that is where the careers of many an electrical and chemical engineer will be made. The cell is a dense assembly of anodes, cathodes, separators and electrolytes. Determining which materials make the safest, densest, longest-lasting battery is a race among researchers the world over. Eighty-eight percent of the world's lithium-ion batteries are made in Asia, according to an analysis by DOE. But the United States is no slouch, producing 20 percent of automotive lithium-ion cells for cars, according to NREL. Some of that output is created by Asian companies with beachheads here, like the plant LG Chem of South Korea has built in Michigan. America's competitive position in energy storage is about to undergo a rapid shift. The main catalyst is Tesla's Gigafactory in Nevada. If it finishes construction as planned in 2020, it will be the largest factory in the world, producing 35 gigawatt-hours of lithium-ion batteries a year — more than the entire world's output in 2013. This is not entirely an American story; Panasonic of Japan designed the batteries and houses workers within the giant plant. Tesla has promised it will employ 6,500 people, making it one of the largest employers in Nevada, though that number may climb to 10,000, said spokeswoman Alexis Georgeson. Packs, management and integration: Beyond the cell, batteries are assembled into packs, which get sizable when made for automobiles and the electric grid. The process is exacting. Batteries produce lots of heat and without careful assembly are prone to catch fire. Then there's the battery management system — essentially, the interface between the battery and the thing it powers, be that a smartphone, a leaf blower or a Tesla Model S. Power electronics help manage the battery's temperature and convert direct current to alternating current. The U.S. excels in testing, reliability and safety of batteries, said Alex Luce, program manager of CalCharge, a battery consortium in California. In power electronics, the U.S. is home to stalwarts like Eaton Corp.; S&C Electric Co., which does its battery work at a factory in Wisconsin; and Parker Hannifin, which builds in North Carolina. Newer players include Dynapower of Vermont, Princeton Power Systems of New Jersey and Ideal Power of Texas. Today's battery supply chain is global and tangled. For example, General Motors imports the battery pack for the all-electric Chevy Bolt from South Korea but assembles the pack for its Cadillac CT6 plug-in hybrid in Michigan before exporting it to China, according to HybridCars.com. Automotive battery pack manufacturing is labor-intensive. The electric drivetrain for every model is different, in just the same way the motor for a Ford Fiesta is different from a Ford Mustang's. "Integrating that isn't like popping in a couple of D cells," said Barteau. "The battery packs are not generic. They're very much integrated to the design of the vehicle itself." 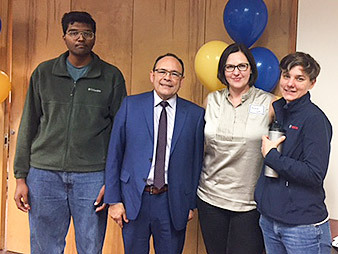 Chandran Lakshmanan, Gary Calderon and Kelly Davis, students of "Battery University," pose with administrator Anna Kurpiewska (second from right). The program at San Jose State University in California is the country's first graduate program to focus on batteries. Photo courtesy of San Jose State University. If the battery interacts with the grid, there is an emerging wave of companies that do the difficult work of meshing elements that have never worked together: batteries, buildings and the electric grid. Relying on software, they enable batteries to shave a building's peak energy demand on days when the grid is strained, or shift the output from solar arrays from the middle of the day to the evening. California startups like Stem and Advanced Microgrid Solutions make building-level storage, while battery integrators like the AES Corp. and Greensmith Energy, both of Virginia, focus on large-scale battery installations installed directly on the grid. But none of these is where the real jobs are. It is at the end of the supply chain — where the rooftop solar panel is tied to a battery, where the electric vehicle sits in the garage or where a battery is installed at the substation — where lots of jobs could manifest, experts said. The model is the solar industry, which has maintained a 20 percent jobs growth rate for four years and is now the second-biggest creator of energy jobs after the oil and gas sector (Energywire, Feb. 7). Most of those jobs are in installation, maintenance, management and integration — jobs that by necessity happen in the community, that generally pay living wages and that often don't require a college degree. The Solar Foundation, which compiled the solar job numbers above, estimates that "solar + storage" will create 27,000 jobs by 2021. The two go hand in hand. The foundation estimated that 18,000 of those storage positions won't come to exist without growing adoption of solar power, since a backup battery solves many of the problems of solar energy as an intermittent power source. A single state, New York, projects that it could gain 27,000 energy storage jobs, up from fewer than 4,000 in 2015. "If you need an interface of more than a 220 plug, there's opportunities for jobs there," Barteau said. As jobs emerge, some will be filled by graduates of the country's first energy storage college degree programs, founded just recently in California and Nevada. Many companies interviewed for this story said they can find the skills they need among the current crop of electricians and engineers. But almost all added that battery-specific training will be needed as the industry expands. The University of Nevada, Reno, has launched a program officially called the Batteries and Energy Storage Technologies Minor. Students call it "the Tesla minor." Tesla's Gigafactory is rising in the desert less than a half-hour's drive east, in Sparks. And the University of Nevada, like the state itself, has pinned its hopes on Tesla as an engine for northern Nevada's economy. The curriculum was designed in consultation with Tesla to custom-fit positions at the factory. Tesla CEO Elon Musk has promised to hire at least 6,500 workers, half of them Nevadans. The university sees the minor as a toehold in sustainable mobility — a catch-all term for the intertwined trends of autonomous driving and electric cars. "We have a bigger plan," said Mridul Gautam, the university's vice president for research and innovation, "and batteries are the ground level." Interest among students has been intense. Two years ago, 600 students lined up for an information session about the gigafactory, and at a separate event, some students waited four hours for the chance to speak with a Tesla recruiter. For the first year's offering, the university expected 10 enrollees and got 25, said Dev Chidambaram, an associate professor. 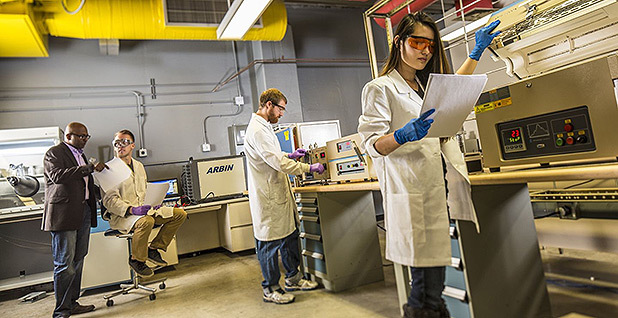 Students take six classes and get hands-on experience building and testing batteries at a $150,000 lab built for the program. A second Tesla-related minor, focused on manufacturing skills, is supposed to launch this year. Cayler Miley, 21, a junior studying computer science and engineering, joined the minor as part of a long-term wooing of Tesla. He applied for an internship, which he didn't get; instead, this semester he is in Germany interning with Audi and studying at an institute. If the university wants to keep talent in Nevada, it may be disappointed. Miley wants to move on to Tesla's design studios in California. The gigafactory, like the minor itself, is a steppingstone. "What I really want to do is work on cars, and with Tesla coming to town, this seemed like the best way to do that," Miley said. The United States has just one graduate program in energy storage, at San Jose State University in the heart of Silicon Valley. Called "Battery University," it began in 2015 to provide an applied, hands-on approach to a big future industry. Other graduate schools, such as the University of California, San Diego, and the University of Michigan, offer coursework in batteries but have not yet declared it as a discipline separate from electrical or chemical engineering. Students in the San Jose State program meet in the evenings and on Saturdays for two years. They take courses in project engineering and management, technical writing, risk analysis, and software and controls. Some instructors come from companies like Google and Applied Materials, and students make visits to local battery labs. In one course, they assemble a battery from scratch, choosing their own materials for anodes and cathodes, and testing the resulting product. Most are in their 20s to 40s, and some have the $25,000 tuition sponsored by employers, which include Tesla, Apple Inc., Samsung and the Northern California utility Pacific Gas & Electric, said Ahmed Hambaba, an associate dean who founded the program. Every company I call on right now is working on battery packs. If you know anything about batteries, you're going to land a really good job in Silicon Valley. The course has summoned a cohort of professionals in adjacent fields like solar, materials, internet of things, testing labs and even X-ray microscopes, said Kelly Davis, 34, who took the course while working at a Bosch research lab. "We had this really diverse cross-section of experience, and that was one of the most useful parts of the program, meeting all these people on similar but parallel tracks. Because batteries are all over the place, but are super-complicated," she said. Davis paid her own way, as does Milton Winkles, a 30-year-old engineering manufacturing representative who has had some energy storage clients and is intrigued by the industry. He wants to get into management. Asked whether there are jobs out there, Winkles said, "Yes. Hundreds. I run into them all the time. Every company I call on right now is working on battery packs. If you know anything about batteries, you're going to land a really good job in Silicon Valley." Battery University is growing quickly, from a group of 20 in the first year to 31 in this year's cohort, Hambaba said, adding that all of the eight students who have graduated so far have found work in the battery industry. One graduate, Gary Calderon, might dispute that conclusion. Calderon, 62, is an electrical engineering graduate of the University of California, Berkeley, who used to run his own storage startup. In recent years, he has worked as a sales rep at SolarCity while selling cars on the weekend in a Tesla showroom. He expected that job offers would pour in when he graduated in December. Unfortunately, he earned his degree just as Trump earned the presidency, and job listings seem to have disappeared. The companies he interviews with seem less interested in his skills and are desperately looking for someone who can provide leads on new customers. He guesses that the unknowns around the new presidency have a lot to do with it. He and many others believe energy storage will keep growing and creating jobs — though whether they happen here or in Asia is anyone's guess. "I thought it was going to be a great market, and I still feel that way," said Calderon. "But I feel like the next four years are going to be a struggle."